In the seventeenth century, Flemish painter Peter Paul Rubens and Dutch artist Rembrandt van Rijn were the two most noted artists in northern Europe, and Diego Velázquez was the unrivaled master of painting in Spain. Velázquez graduated from Don Francisco Pacheco’s workshop academy in Seville, married his daughter, and a few years later moved to Madrid. Soon he was working for King Philip IV at the Spanish Court where he remained throughout his life. While he was still in Seville, Velázquez further developed skills and expanded his range of subjects by painting domestic settings. Kitchen scenes were popular with the public and often they conveyed an underlying message connecting everyday life in Spain with biblical events. 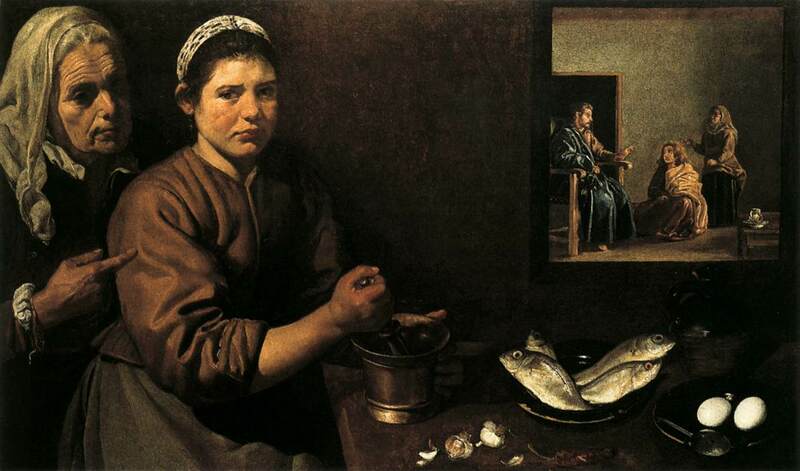 “Christ in the House of Martha and Mary” depicts a scene of a maid preparing garlic mayonnaise to go with the fish that will be served for dinner. The maid’s expression indicates she is upset and the woman behind her is calling attention to a scene in the upper right corner of the painting. We can not be sure if the smaller scene (like an inset) is intended to be a reflection in a mirror, a hatch (an opening) through which we are looking into an adjacent room, or a painting on the kitchen wall. Velázquez used devices such as reflections and paintings within paintings throughout his career. In the usual interpretation of this painting, the two figures in the kitchen and the figures in the upper right hand scene are many centuries apart in time. The smaller scene shows Jesus seated in the home of Martha and Mary (Luke 10: 38-42). Mary is seated at his feet and Martha is standing behind her. In the biblical story, Martha became busy serving food and drink while Mary seemed oblivious to the fact that her sister was doing all of the work alone. Instead of helping her sister, Mary sat down and listened to Jesus. Martha was frustrated at this and wondered if Jesus cared that her sister was leaving all of the serving chores up to her; she hoped Jesus would ask Mary to help her. Jesus told Martha that her concern was misplaced and that in sitting and listening to him, Mary had made a good choice. The frustration of the maid pictured by Velázquez is similar to that of Martha. She is trying to make preparations for a meal but is working by herself and is distraught about all that needs to be done. The woman behind her is calling the maid’s attention to the scene of Jesus, Martha, and Mary; pointing out that spiritual nourishment is an important part of life as well. It has been suggested this kitchen scene is not set in seventeenth century Spain but rather is in the home of Martha and Mary when Christ was there. If this interpretation of the painting is accepted, the person believed to be an upset maid in the kitchen is actually Martha herself and the second woman with Jesus in the smaller scene is another guest.